Our menu features a variety of delicious breakfasts (including our amazing bacon bowls!) served all day, as well as lunch and dinner options like sandwiches and pizza. We also have tons of amazing drinks, like our Naughty, Naughty, Bad! 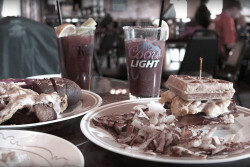 Milkshakes, Curfew Extender Coffee drinks, and a variety of delicious Bloody Marys in the back at Bloody Mary’s Back Bar.